"This ultra easy, wholesome salad uses dried mint in an olive oil dressing with avocados, hearts of palm, black olives, cherry tomatoes, and cucumber. Choose iceberg, romaine, or butter lettuce for the greens." 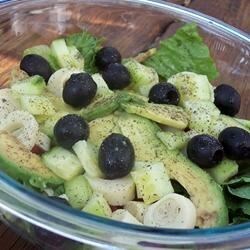 Place the lettuce in a bowl, and add the cherry tomatoes, hearts of palm, black olives, avocado, and cucumber. Season to taste with garlic salt, salt, and pepper. Rub the dried mint between the palms of your hands, and sprinkle over the salad. Drizzle with olive oil, and toss. Add additional olive oil if needed to lightly coat all ingredients. This was really good. I'm a big fan of dressings that don't cover everything up, and this one works for me. Thanks for the recipe! This was an easy and quick salad to make. I added some red wine vinegar and a little honey to the dressing. the mint was a really nice touch. the oil and the avacado made sort of a paste that coated everything. Very good!